Coaching and ideas to help build agile and resilient practices. When it comes to New Years Resolutions I have not been very resilient, what about you? 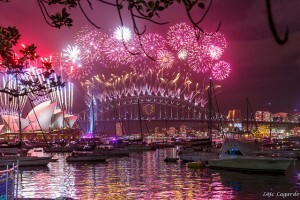 It is easy to get caught up in the excitement of the big night, fireworks (Sydney is certainly one of the first and as the picture shows, one of the best normally), retrospectives of the year past and motivation to make changes in our lives for the next 12 months. Generally the resolutions don’t stand the test of time. The past 5 years I have adopted a different approach – using 3 words that act as reminders and focal points on a daily basis. I found this approach via Chris Brogan. Here is the link to Chris’s description of the approach and his words as examples. My words from previous years may not mean much to you – that is not the objective, they just have to mean something to me. You can click through and read what my intent was each year as an example. So as we get back to thinking about work after the holidays, here are my three guiding words for 2015. 274 – ok it is a number rather than a word, but it is my primary focus and objective of the year. It represents the number of words I want to write each day. It focusses me on the need to write each day, and to get back into writing and publishing on a regular basis. This area of focus is multi-dimensional, and will explain it in more detail in a subsequent post. Primary meaning flowed from the project I focussed on last year around application of Agile principles to BC and resilience. We need to be able to articulate the value proposition in what we do – and that especially applies when evaluating the numerous distractions that often derail our efforts at focussing. I will elaborate on my focus areas a little more in subsequent posts. What are your focus areas for 2015?